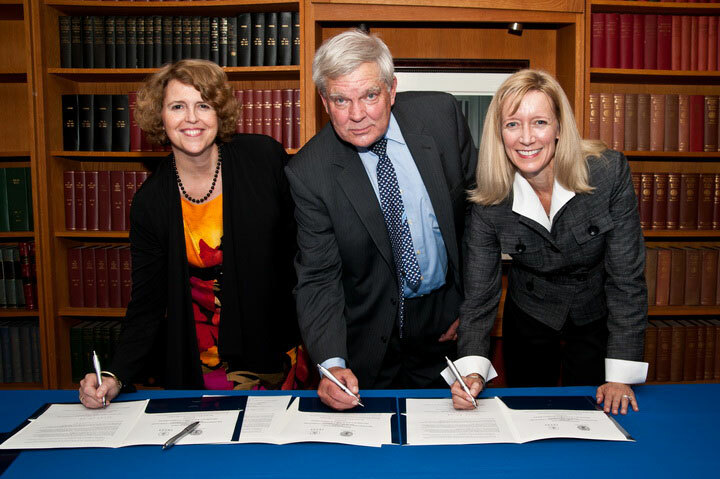 Officials from the International Trade Administration (ITA) and Georgetown University gathered together on September 22, 2011, in Washington, D.C., to sign an agreement establishing the Alysia Wilson Memorial Internship. The internship honors the memory of Alysia Wilson, an employee in ITA’s Office of the Western Hemisphere, who passed away in 2011 after a battle with cancer. Wilson was a 1990 graduate of Georgetown’s Edmund A. Walsh School of Foreign Service. She began work at ITA in 1998, where she eventually became director of the Americas Project Team in ITA’s Market Access and Compliance unit. She spearheaded the conceptualization and organization of the first Americas Competitiveness Forum, which was held in Atlanta, Georgia, in 2007. Wilson also championed ethical reform in Latin America by extending the Department of Commerce’s Good Governance Program into the region and overseeing the production of a Spanish-language edition of a related handbook, Business Ethics. The agreement with Georgetown provides for the recruitment of qualified graduate-level student interns for each academic term. The first two interns chosen for the program, Gabriel Maia de Needell and Eric Toler, were introduced at the signing ceremony. They will be working in the Office of the Western Hemisphere on some of the same issues and projects led by Wilson.